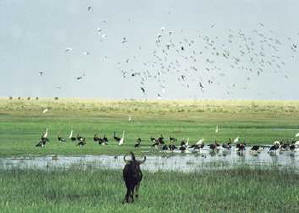 Zambia has an incredible wildlife asset, a natural heritage with many unique species of wild game. The superb wild animals are found in pristine wilderness. This ensures that the finest safaris are available. The safaris may be arranged from our theme-designed hotels, lodges and safari companies. Travel agents will help too. You needn’t worry yourself about how you’ll travel. The travel agents and safari operators will take you on tours of your choice. Either on bush walks or safari drives, either at night or during daylight, either way you’ll be able to enjoy a wildlife safari of your choice. Think of whatever wild animal or a group of animals you would like to see... You still have options of safaris to choose from. If you’re more adventurous go for the big five. Elephant, lion, leopard, rhino and buffalo. Your safari tour operators will advise you where to go. There are well known wildlife safari routes which will ensure common sightings of large animals such as elephant, hippo (hippopotami), buffalo, giraffe, zebra, warthog, primates, antelope and various reptiles and rodents. It is all up to you, only your choice counts! As for the predators there are many to see in action. The cheetah (fastest animal on land), the leopard (shy lone hunter), the lion (the legendary king of the jungle), the spotted hyena (the "wild strongest" teeth), a pack of wild dog, etc. There are also smaller carnivores such as the honey badger, African wildcat, mongoose jackal, etc. All these predators help to keep in check the populations of various wildlife species. You may wish to watch in action the crocodile, "the undisputed king of river predators", stalk its prey. Legend beholds that a single meal will keep the crocodile for several months, perhaps even half a year. This is the reason for the croc’s patience. It will wait for its prey to come and drink water at the river's bank. With its powerful tail and incredible strength the croc will beat the animal into the water and with its bite pull the prey under water to drown it. Keeping well away from croc infested water bodies is good advice. Most Zambian rivers and lakes including swamps and wetlands support fish life. Take the southern tip of Africa’s oldest and deepest Lake Tanganyika. More than three hundred fish species have been logged there. This is the site for the annual fishing competion. Another place great for tiger fishing is Lake Kariba and the Zambezi River. Zambia is named after the Zambezi, a river reserve for giant carp fish, tiger, vudu, bream, etc. Zambia’s wildlife supports good birding. She is a birders' paradise too! Ornithologically speaking, a whopping 749 bird species have been recorded so far! The common bird sightings include doves, pigeons, parrots, cuckoos, owls, nightjars, kingfishers, hornbills and the broad-billed roller, barbets, honey guides, woodpeckers, swallows, the fork-tailed drongo and flycatchers, red-necked falcon, crested guinea fowl, African broadbill, black-breasted snake eagle, and the lesser spotted eagle. African travel is not complete until when you see the wildlife in it’s natural habitat. What’s more, you remain to choose what game to watch and what national park to visit. And the tourist operators, eager and tripping all over themselves, will be glad to help you. State your wish and you’ll be offered a safari tour in one of the national parks most ideal to ensure your maximum satisfaction. 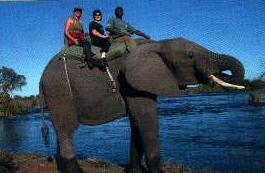 Choose what game to see, what safari to join, and above all, learn more about Zambian tourism . Take that wildlife safari now!